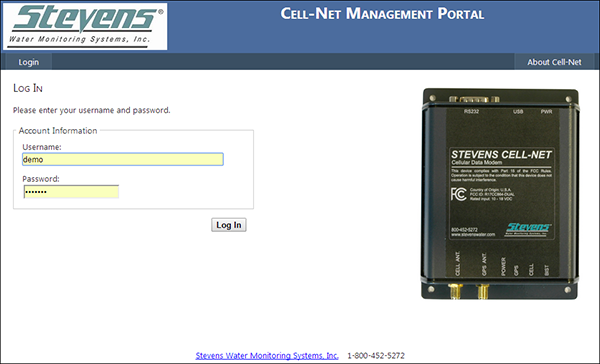 Stevens Cell-Net modems can be configured either locally using the "Cell-Net-Set" configuration program installed on a computer, or over the internet through the secure management portal at cell-net.com. 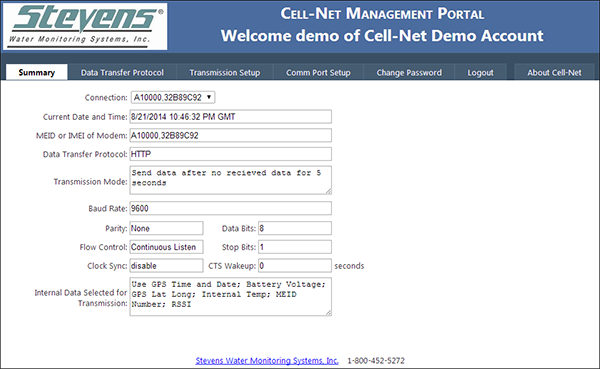 The cell-net.com management portal interface is much the same as the local version, but can be used to reconfigure a Cell-Net modem that is deployed in the field from anywhere in the world with an Internet connection. 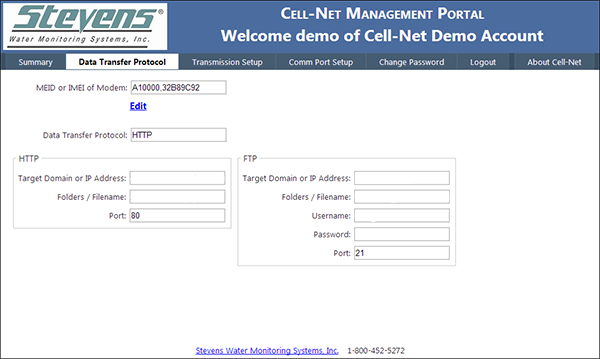 This is the main homepage for the Cell-Net Management Portal, where authorized users can log into their Cell-Net account and maintain / reconfigure their connected Cell-Net modems. 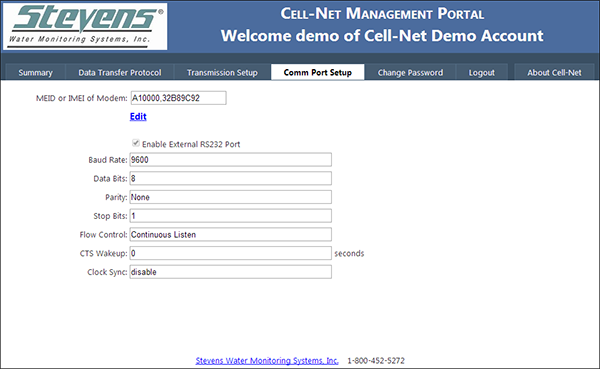 The Summary screen provides a quick overview of the current configuration settings for the connected Cell-Net modem. Information includes modem MEID or IMEI number, data transfer protocol setting, transmission mode, baud rate, and other related settings. The Data Transfer Protocol screen allows the user to configure their choice between HTTP or FTP data transfer from the modem. 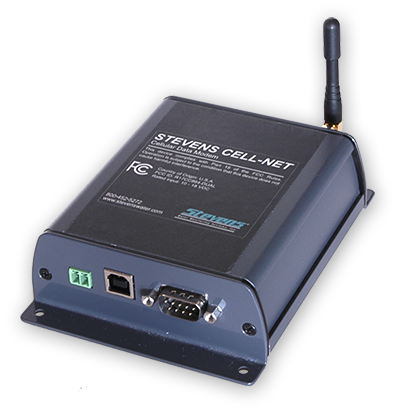 Transmission Setup allows the user to select the timing of data transmissions, and tell the Cell-Net what data to transfer each time a transmission is sent. 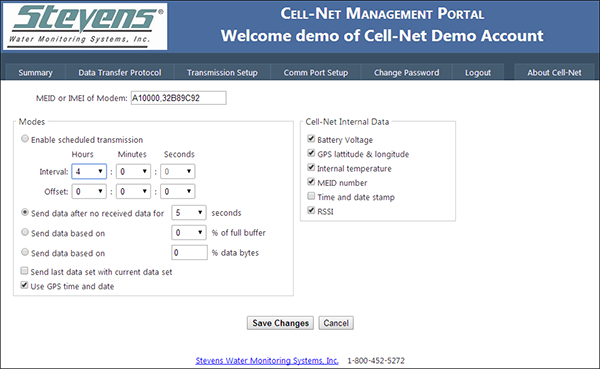 Configure the baud rate, data bits, and other data communication information.